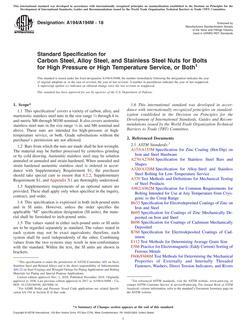 1.1 This specification2 covers a variety of carbon, alloy, and martensitic stainless steel nuts in the size range 1/4 through 4 in. and metric M6 through M100 nominal. It also covers austenitic stainless steel nuts in the size range 1/4 in. and M6 nominal and above. These nuts are intended for high-pressure or high-temperature service, or both. Grade substitutions without the purchaser's permission are not allowed. 1.2 Bars from which the nuts are made shall be hot-wrought. The material may be further processed by centerless grinding or by cold drawing. 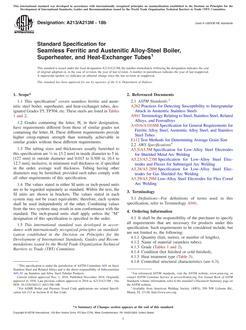 Austenitic stainless steel may be solution annealed or annealed and strain-hardened. 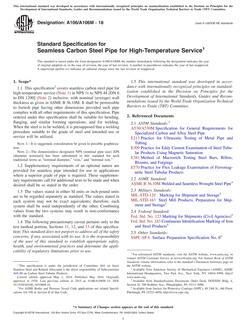 When annealed and strain hardened austenitic stainless steel is ordered in accordance with Supplementary Requirement S1, the purchaser should take special care to ensure that 8.2.2, Supplementary Requirement S1, and Appendix X1 are thoroughly understood. 1.3 Supplementary requirements of an optional nature are provided. These shall apply only when specified in the inquiry, contract, and order. 1.4 This specification is expressed in both inch-pound units and in SI units. However, unless the order specifies the applicable “M” specification designation (SI units), the material shall be furnished to inch-pound units. 1.5 The values stated in either inch-pound units or SI units are to be regarded separately as standard. The values stated in each system may not be exact equivalents; therefore, each system shall be used independently of the other. Combining values from the two systems may result in non-conformance with the standard. Within the text, the SI units are shown in brackets.